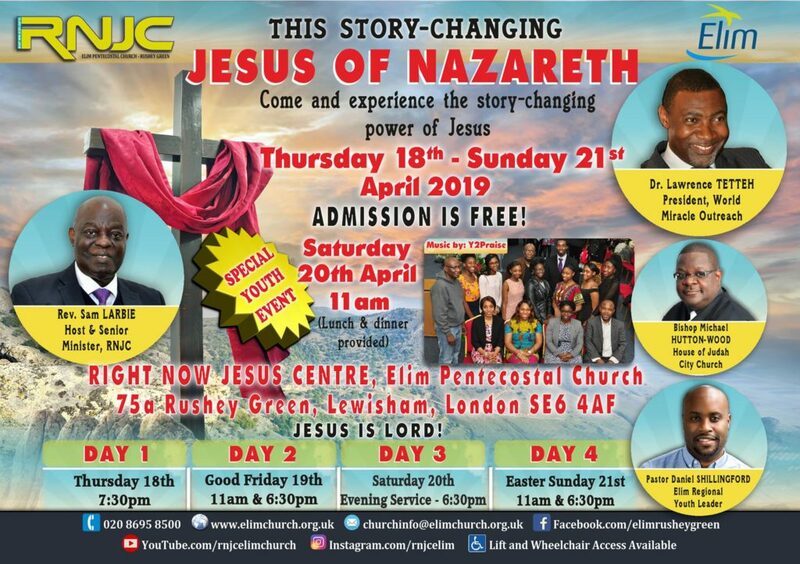 Come and experience This Story-changing JESUS OF NAZARETH, this Easter at the Right Now Jesus Centre. Ministers include Rev. Dr Lawrence Tetteh, President of the World Miracle Outreach, Bishop Michael Hutton-Wood of the House of Judah City Church, London. Pastor Daniel Shillingford our Elim Regional Youth pastor and your conference host, Rev. Sam Larbie. With worship & praise music led by RNJC Y2Praise choir. There will also be a special Youth Event to engage the issues affecting today’s youth, with Pastor Daniel Shillingford and other inspirational speakers. This unique Youth Event will make a difference in your life. (Lunch & dinner will be provided). Clear your diaries and prepare to experience the Story-changing power of Jesus of Nazareth. You won’t want to miss this event. ADMISSION IS FREE! WHEELCHAIR ACCESS AVAILABLE. We look forward to you joining us at these events. You will be truly blessed!